Review: Delaney Maxwell falls through the ice into a freezing lake and is pulled out by her best friend Decker. She was underwater for eleven minutes and is dead. Amazingly, she is revived and seems fine. While she physically looks okay, Delaney knows something isn't right. She can tell when people are going to die. She meets a new boy in town, Troy, who was in a coma and appears to have the same ability as her. Delaney's is excited to meet someone like her...or is he? Random comment-I'm originally from Maine and read two books this month based in Maine. Super cool! Anyway...back to the book. 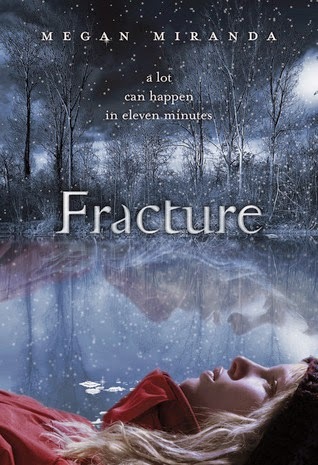 I think the premise of the book was good and Miranda did a great job with the opening scene of Delaney falling through the ice. I think the relationship between Delaney and Decker (best friends, they both have an attraction to each other but haven't acted on it) was the most realistic portrayal male/female friends I've read thus far. She nailed the jealousy and awkwardness perfectly. It was clear Troy was a shady character early on and I enjoyed seeing Delaney trying to figure out what was happening with her "about to die radar" and her relationship issues. My trouble with this book was that for a book about a girl who died and defied natures laws to come to life, it was pretty boring for most of the book. There is a companion book or sequel though written from Decker's point of view after this book ends, and I will probably read it.